Where To Buy Korean Silk? Recently, it was my first time looking out for silk at Gwangjang or Kwanjang Market which is located near Jongno-5-ga station, Line 1. If not for accompanying Afri and her family; I think there won’t be an occasion of me buying cloth over that market. Me and piece of silk doesn’t go well with each other..hehe. Initially, we went out from Exit 8 as the signboard inside the subway led us to. 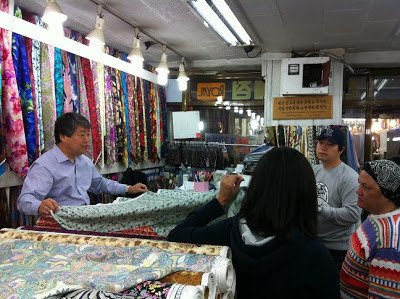 However, after exploring the route again with Ayu; we found that Exit 11 is nearer to the silk shops at Gwanjang Market. Side note: This post is not an advertisement for Hyun Woo Silk but I found that dealing with Mr Hyun Woo (not the one from TTMIK yeah? hehe) was a breeze. He speaks decent English so fret not. In our case, when I mentioned that I was from Malaysia the shop owner immediately discounted 5,000 won per metre from the price. 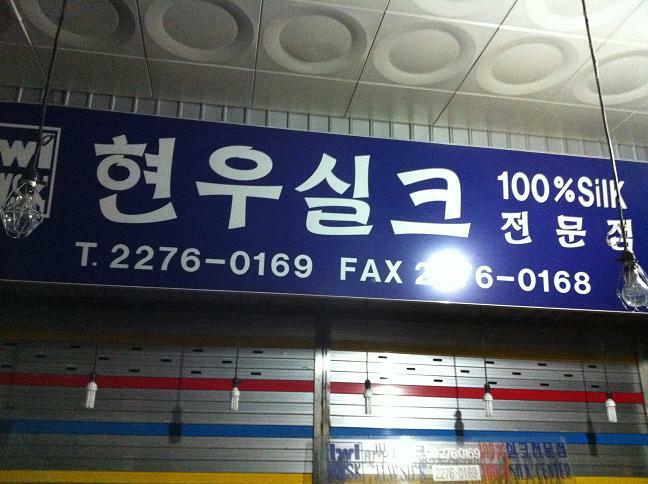 How to go to Hyun Woo Silk? Once you go out from the Jongno-5-ga subway station, Line 1, Dark blue; you would see that there are 1 to 8 exits but there is no exit 11 to be found from the subway’s signboard. Don’t fret..just go towards the direction of the restroom aka toilet and walk straight until you find rows of underground shops selling Hanbok (Korean traditional clothes). 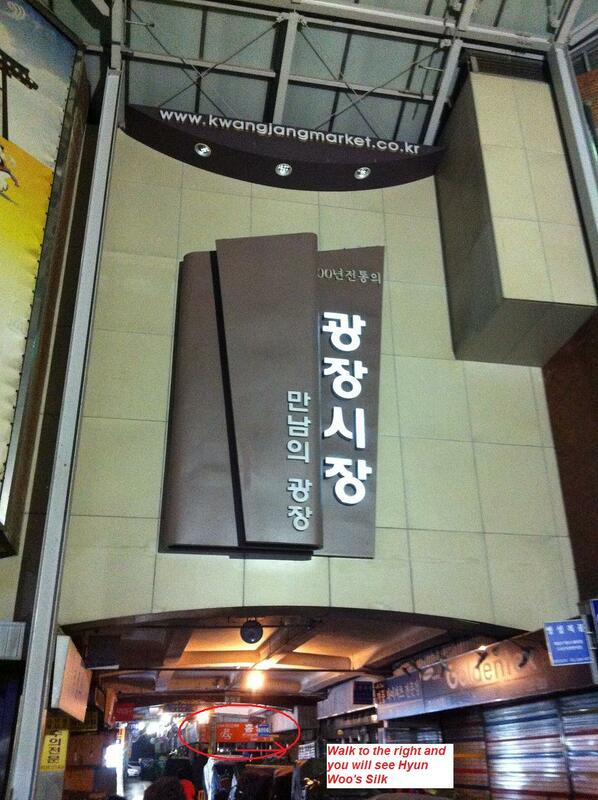 After that, walk straight about two metres and you will see the entrance of Kwanjang or Gwanjang Market on your left. 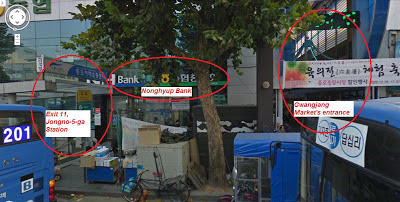 Nonghyup (NH Bank is on your left). Walk into the market and go straight until you see this signboard. But don’t go up that stairs unless you want to make Hanbok. Walk through this and you will see an orange signboard shop, turn right. This is Hyun Woo Silk. They are closed every Sundays. Mr Hyun Woo and his son with Afri and her mother. 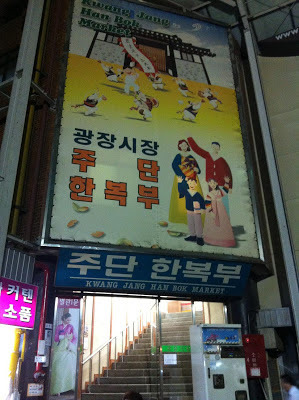 More information about Gwangjang or Kwangjang Market at KNTO here. oh ye? if i know this earlier. hiks. I would like to ask if you know the cost of purchasing Silk Hanbok from Gwangjang Market? 4. Enter the left door, walk forward a little bit then turn left at your first lorong. 5. Walk straight til the end of lorong. There's a silk shop where students normally go on your right. 6. There's a sign 'Silk for Baju Kurung'. The ahjusshi is really nice and he can speak English. Just wanna know abt the weather? Is it summer already or still in spring season? the one at Gwangjang is about 82,000won for 4 meters. the one at Dongdaemun is about 9,000won per meter. but after going for both places, I could feel the quality of silk is very different!! 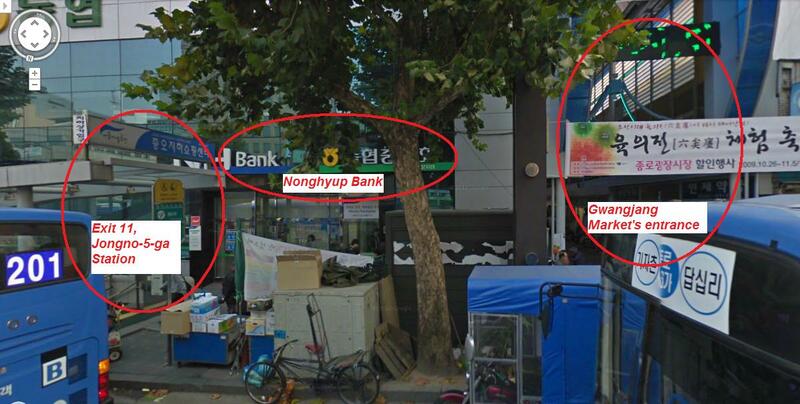 may I know what time this Gwanjang market close?